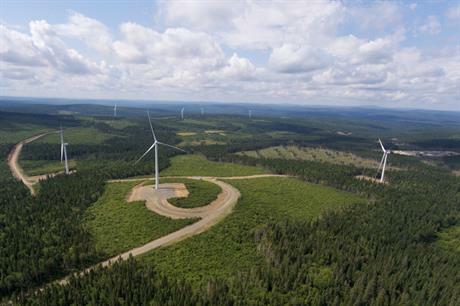 CANADA: Boralex has acquired US developer Invenergy's economic interests in five wind farms in Québec with a net installed capacity of 201MW for C$215 million (US$165 million). The projects, which are located in the east of the Canadian province, were commissioned between March 2012 and December 2016, and have a gross capacity of 391.35MW. They comprise turbines supplied by Enercon and GE, and sell output to utility Hydro-Quèbec Distribution under long-term power purchase agreements (PPAs) expiring between 2032 and 2041. Boralex will become the new manager of the sites, assume facilities management agreements, and manage the day-to-day affairs of the projects, it stated. And the 21.1MW Des Moulins II project. The acquisition increases Boralex’s net installed capacity to 1,820MW, including 568MW in Québec. Patrick Lemaire, president and CEO at Boralex, added that the company may be able to take advantage of "operational synergies" following the acquisition. La Caisse de depot et placement du Québec, which owns a 52.4% interest in Invenergy Renewables, also has a stake in the Le Plateau I project. The Canadian pension fund manager is also the largest shareholder in Boralex, with a 17.3% interest in the company. Meanwhile, Boralex added that community developer Régie intermunicipale de l’énergie Gaspésie-Îles-de-la-Madeleine waived its rights of first offer to acquire Invenergy’s economic interests in two of the projects. It has a 40% stake in Le Plateau II and owns 16.7% of Roncevaux.